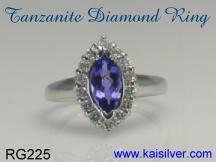 Tanzanite is a gemstone that has gained tremendous demand in a matter of few decades. Tanzanite diamond rings are a category of jewels that carve out a class of their own. Many designers are of the opinion that, the stunning beauty of tanzanite makes it an attention grabber even all by it's own. There however is no denying the fact that, a diamond tanzanite ring has an aura of extravagance and luxury. As awareness of the rarity of this gemstone and it's stunning beauty increased, jewelry lovers began choosing diamond tanzanite rings as a wedding or engagement ring. Both men and ladies today, proudly wear tanzanite diamond rings in gold or 925 silver. When you choose a gold or silver tanzanite ring with diamonds, make sure that the tanzanite gemstone is the main focus. Many gem buyers are not aware that, tanzanite is actually rarer than a diamond. There is just one small portion of land in Tanzania that, provides any scope for commercial mining of tanzanite. We would be over exaggerating if we told you that, all the tanzanite in the mines would have been dug out within a decade or two. But the point is that, the limited supply of this gemstone does indicate that tanzanite would run out within 30 to 40 years. The high price of this gemstone did motivate professional gem mining companies to, look for tanzanite gems in other parts of the globe. There is absolutely no indication that tanzanite resources might exist in a location outside of Tanzania. Tanzanite diamond ring designs, where the ring is set with a large number of small diamonds are generally popular with ladies. When it comes to diamond tanzanite gemstone rings for men, the number of diamonds might be few but, the size of diamonds rarely goes below 2mm. An interesting concept for a diamond tanzanite ring is to have the a marquise shaped gem bordered with small diamonds. The small diamonds appear like a glittering line separating the tanzanite gem from the metal. Mens tanzanite diamond rings with diamonds all around the gem are not very common. Diamond tanzanite rings worn by men generally, have a few diamonds on either side of the gemstone. 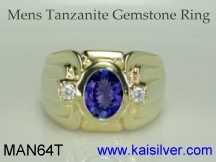 In this section, we bring you some fine tanzanite gemstone rings with diamonds. At Kaisilver we can custom make any of these mens tanzanite diamond rings in gold or 925 silver. If you have a design of your own that you would like to use for your tanzanite ring, we will be glad to custom make the jewel for you. The fact that we provide the same quality of diamonds, gemstones, design and craftsmanship for a gold or 925 silver tanzanite and diamond ring makes us one of the preferred sources for this jewel. Our support teams at sales@kaisilver.com will be glad to answer any gem or jewelry queries that you might have. We believe in educating and providing information rather than, pushing for a sale. So do contact us irrespective of where you plan to buy your gems or jewelry from. A white gold tanzanite diamond ring, a stunning jewel that compromises on nothing. A handpicked custom cut marquise shaped tanzanite gem is bordered by diamonds. The glitter provided by the diamonds, gives the RG225 diamond and tanzanite ring an extravagant and luxurious look. You could order your tanzanite gold ring with diamonds in white gold, yellow gold or rose gold. While we do agree that, rose (pink) gold tanzanite rings are not very common, rose gold strikes an interesting contrast with the white diamonds and tanzanite gemstone. Since we provide the same quality for both, gold and 925 silver tanzanite diamond rings, you could request for the same ring to be custom made in silver too. Tanzanite as a gemstone is not very old, the beauty of the gem brought it instant fame the moment it was introduced into the gem and jewelry markets. You would be aware that, the birthstone charts are quite static. Tanzanite was added as a birthstone option for blue turquoise and blue zircon - so you can choose this gemstone if you are looking for a stunning tanzanite diamond ring in gold or silver. You can get to know more about this gorgeous tanzanite and diamond ring here. A mens tanzanite diamond ring, a handsome ring with an impressive metal weight. You will notice that most diamond tanzanite rings for men have diamonds that are in the 2.5mm to 3mm size range. 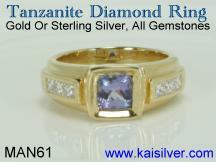 Your Kaisilver tanzanite diamond ring can be ordered in gold or 925 sterling silver. We ensure the same quality of craftsmanship and material including gemstone, for the gold or silver tanzanite diamond ring. It is true that yellow gold is very popular with men but, the sustained increase in the demand for mens white gold rings has been quite impressive. Pink gold or rose gold is not very common in mens jewelry but, it is true that tanzanite and white diamonds cast a tremendous spell when set in pink gold. The gemstone in this tanzanite diamond ring is eye clean and custom cut by our expert gem cutters. We can provide a certificate of authentication from an independent gem testing laboratory if you wish, a small additional testing fee will be added to the price. Tanzanite diamond rings can be worn as every day jewels or be purchased as, wedding or engagement rings. You can read all about this tanzanite diamond gold or 925 silver ring here. An interesting diamond tanzanite ring, the MAN61 gold or silver ring combines a modest gemstone size with fine princess cut diamonds. This tanzanite gem stone ring with diamonds, has some very interesting features that enhance the durability of the jewel. The center cushion shaped tanzanite is set a little below the surface of the ring, this keeps the gem out of harms way from physical impact. Observe the way that the gemstone in is mounted in this mens tanzanite diamond ring. By bordering the entire gem with metal, we have avoided. the use of prongs. We do understand that, prongs can stick in pockets and other places. When this happens, the gem gradually loosens due to prongs that open up. The diamonds in the tanzanite gold or silver ring are, princess cut and handpicked by our diamond assorters. If you would like to a have a diamond tanzanite ring that is well designed and durable, this is one ring that should be on top of your priority list. 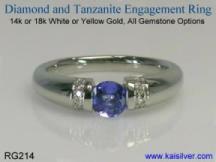 Like all other Kai Silver jewelry, you can order this tanzanite diamond ring in gold or 925 silver. Both 14k and 18k gold options are available and the choice for gold colors is yellow gold, white gold or pink gold. Read all about this awesome diamond and tanzanite gemstone ring here. The RG214 tanzanite diamond gold ring from Kaisilver, is a fine tanzanite ring that has been designed and crafted to perfection. This ring does not aim to be the most extravagant jewel in town, it was designed to be a sleek well crafted tanzanite gold or silver ring offering good value for money spent. Priced moderately enough to be worn as a regular fashion accessory, it has all the features that would qualify it to be a recommended choice for a wedding or engagement ring. The diamonds in this ring are on either side of the gemstone, this is basically the edge of the band ring. Very few jewelers care to custom make quality silver jewelry but, we are an exception. We can custom make this tanzanite diamond gold ring or any other jewel, in gold or 925 silver. By assigning the same team of designers, craftsmen and gem experts to orders received in gold or silver, we prove our commitment to quality irrespective of the metal choice. The design structure of this diamond and tanzanite ring, ensures that the jewel looks great for every ocassion. If you are interested in wearing a tanzanite ring as a wedding or engagement ring, choose the RG214 diamond and tanzanite ring - it offers great value for the money that you invest. Check out more details about the ring here.